Pumpkin everything, everywhere. I’d be lying if I said I wasn’t excited. Pumpkin just makes things taste better. The spices warm you, and the comfort is just what the cool weather calls for. Pumpkin is perfect for Fall. 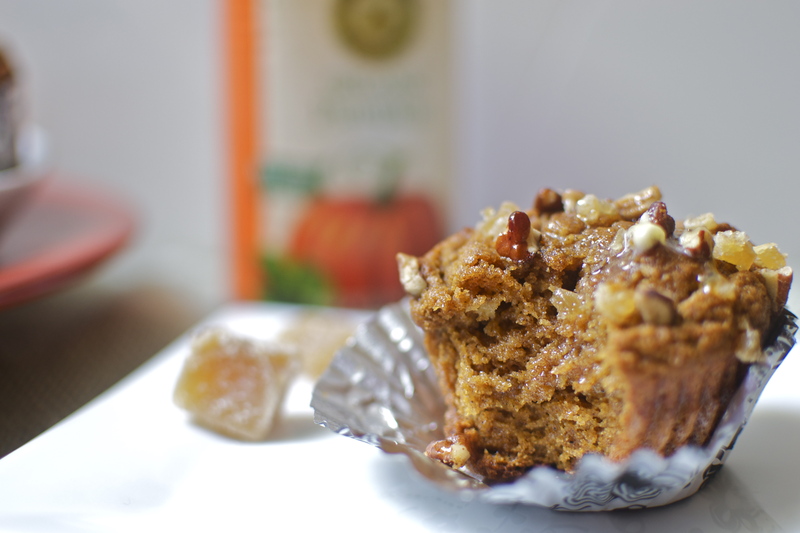 Unfortunately, my most favorite pumpkin foods aren’t too gut friendly (curse you, Starbucks). Before I caved and chowed the alluring gluten bombs I whipped up these muffins. They hit the pumpkin spot just in the knick of time. These muffins aren’t too sweet. 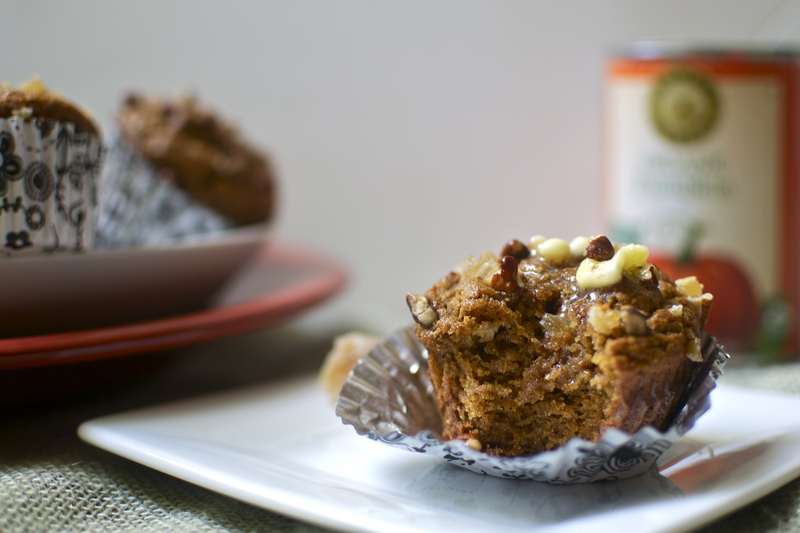 If you prefer a sweeter muffin add 2 tbsp of coconut sugar to the batter. Though this batter could make 12 muffins, I prefer to make only 10 so that they plump up just a bit bigger. They are perfect topped with crystalized ginger, your favorite nut, or raw pumpkin seeds. These muffins only get better over the next couple of days. In a large bowl mix together the melted oil and maple syrup. Mix in one egg at a time, making sure it’s fully incorporated before adding the next. Mix in the pumpkin puree. Gently mix in the dry ingredients. Scoop the muffin batter evenly into 10 muffin liners. Top with toppings if desired. These look mighty tasty. 🙂 is there anything I could sub for the tapioca flour? eek, I’m really not sure !!! almond meal could work but it would probably need more than 1/2 cup. arrowroot is also a possibility, but I haven’t tried either ! Oh my, how delicious and moist these muffins look! Might need to whip up a batch soon. I am totally pumpkin cray at the moment and these seem perfekt to satisfy this craving. same! Pumpkin has taken over my life lol hope you enjoy ! Those look delicious! My daughter (Chelsea Miller) pointed me in your direction. Your blog is lovely and so is your instagram!!! oh goodness, thank you so much !! both the work you and Chelsea do is amazing !! Pumpkin makes the world go ROUND! I don’t know why we all only focus on it in October and November! ha ha. Yum. I can’t wait to try these! These look great! 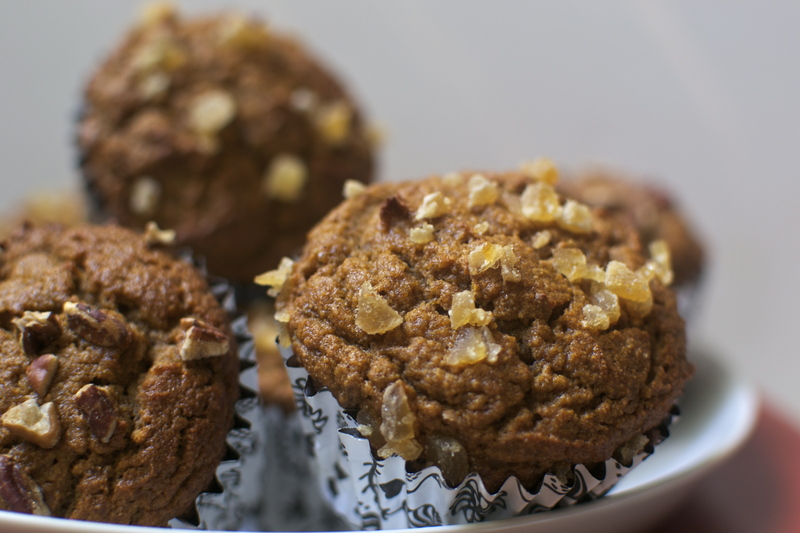 I have been trying to make good pumpkin muffins/cupcakes without almond flour, but mine keep coming out with a weird texture (dense and almost soggy). I’ll have to try this recipe. I love the idea of crystallized ginger as a topping! I try to avoid nut flours whenever possible ! I love the texture of these 🙂 hope you enjoy too !